Why do states comply with international law? It has been a debatable proposition as to why states obey international law since international law, unlike domestic law, lacks a judicial authority to enforce it. The sovereignty of state appears to be the stumbling block for creating a global authority to enforce international law. 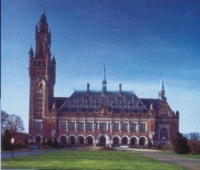 The International Court of Justice (ICJ), based at The Hague (Netherlands), can only hear a dispute, if the states involved agree to its jurisdiction. In the recent case of Israel's disputed construction of wall on the Palestinian West Bank, Israel did not submit to its jurisdiction and stayed away from the proceedings of the court. At the request of the UN General Assembly, on 9th July, the ICJ delivered its Advisory Opinion (not a judgment) declaring the illegality of the construction of wall, but the Opinion is not binding on Israel. Another roundabout way of enforcement of international law is to request the Security Council of the UN to call upon a state to obey international law. However, since five permanent members (namely China, France, Russia, UK, and USA,) of the 15-member Security Council have the right to veto or block any decision of the Council, it is hardly a suitable machinery to invoke enforcing international law. After all, the Security Council is a political institution, not a judicial body, and that is why its decisions are guided primarily by political considerations, and not by rule of law. The above two instances show that generally speaking, international law can only "bark" but not " bite" a sovereign state. Why do states obey or comply with international law? It is observed that almost all states (at present 192) mostly comply with international law. Ships, airplanes, postal and other services continue to do their regular schedules smoothly among the states because of the compliance of international law. For instance, a letter posted in Dhaka with valid Bangladesh's stamps reaches to an addressee in London without any charge and vice-versa. This occurs because of the rules of the Universal Postal Union. There are various theories as to why states comply with international law. Professor Franck believes that the answer lies in the concept of legitimacy. To Professor Frank legitimacy means that quality of law must derive from a perception, to those to whom it is addressed, that law has come into being in accordance with right process. Right process includes not only the notion of valid sources but also encompasses socio-anthropological insights into the values of a given society, local regional or global. He argues that legitimacy will depend on four specific properties: ( a) transparency, (b) approval of an established valid authority, (c) consistency in application and ( d) adherence. In other words, Professor Franck develops his argument that since there exist four objective criteria that may assist in ascertaining the core elements of right process, bringing law with a high degree of legitimacy. Once legitimacy exists, states obey international law. Sir Austin advocated the imperative theory of law as the motive behind the observance of international law. What he meant was that the usefulness of compliance of international law would motivate states to obey them. All states wish to live in peace and prosperity and therefore orderly and peaceful conduct of international relations among states depends on some kind of accepted norms and rules of behavior from states. Another jurist D.J. Harris explains that necessity of peace is felt so strongly by states that they observe rules of law in inter-state relations. A few legal writers link political and social system within the states with the compliance of international law. They argue that if a government is democratic, transparent and accountable to people, the decision-makers will invariably follow rule of law including international law in respect with other states. Law is dynamic and therefore it evolves in the way that respects rule of law because justice must prevail. Plato and Aristotle defined " Justice is the mother of all virtues and consists in providing to every one its due without asking." The bottom line of all the above theories is that states obey international law because of (a) necessity of peaceful relations and (b) pressure within the international community. All states wish to have the reputation of being credible and trustworthy. They like to be respected in the comity of nations. Breaches of international will tarnish an image of a state within the international community. For instance, Sudan has been in gross breach of international humanitarian laws to its own people in its province, Darfur, from where millions of non Arab Africans have fled and taken refuge into neighbouring state, Chad, because of the massacre perpetrated by Arab militia, Janjaweed, allegedly supported by the Sudanese Government. Now Sudan has agreed to address the problem because its reputation has been badly affected and the UN Security Council has adopted a resolution that unless Sudan resolves the issues in accordance with humanitarian laws, it may impose sanctions. Is the basis of international law uniform? The foundation of law may differ from state to state because law is an expression of social order and community values. What one can do in Italy cannot do the same in Bangladesh because it may constitute an offence in Bangladesh (For instance, a Muslim may drink alcohol publicly in Rome but not in Dhaka, or a tribal person in tribal areas in Pakistan can carry a gun without a license but not in settled areas in Pakistan). Each country looks at law from its own culture and customs. A large-part of international law is Euro-centric and is based on Christian values. International law was founded in the West and its father is the Dutch jurist, known by his Latin name, Grotius ( his Dutch name is Hugo van Groot) who was born late in the 16th century (1583-1645). He legal writings were the fullest, systematic and scholarly exposition of international law. After the 60s, most of the developing countries in Asia and Africa became independent states and they have confronted with the body of rules of international law made by the Western nations. Many of them are not comfortable with the inherited international law because they do not meet their needs and values. They want to change some of the traditional rules of international law through the UN International Law Commission. The developing countries argue that the weakness of international law lies in the fact that they do not often reflect the values of the existing international community. For instance, the existing refugee law does not meet the needs of the 21st century. The UN Refugee Convention of 1951 is completely outdated and was adopted to meet the needs of the 50s. It ought to be updated to include situations from where people take refuge in other countries because of armed conflicts within a state, nuclear accidents ( Chernobyl nuclear accident in 1984) and natural disasters. Wilfred Jenks is of the view that " international law is not a set of rigid laws inherited from the past and allowing no scope for development but a body of living principles in the light of which new problems can be resolved as international relations develop". Often big powers obey international law for its convenience, not for conviction. Big powers should respect international law in all circumstances. They should not pick and choose international law when it suits them. They will use international law if it suits their interests but they would drop it, if it stands in its way. For instance, the US has invaded Iraq, without UN approval. That has meant that the US has ditched international law, enshrined in the UN Charter, for its political agenda. Such unilateral action by the lone superpower endangers the credibility of international law. International law will command respect and compliance if it is adhered to by all states-big and small, powerful and weak. International law must meet the needs of the day. It must evolve taking into account of new realities in the inter-connected world. The voices of developing world must be heard in the codification of international law. Respect for international law will only bring peace, security and harmony in the world. There is no alternative to it.